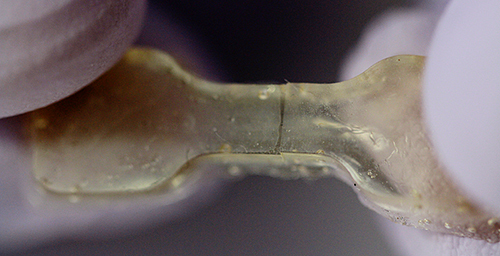 A close-up of an elastic polymer that was cut in two and healed overnight. CHAMPAIGN, Ill. - Look out, super glue and paint thinner. Thanks to new dynamic materials developed at the University of Illinois, removable paint and self-healing plastics soon could be household products. Researcher Hanze Ying demonstrates the making and self-healing properties of a new dynamic polymer. U. of I. materials science and engineering professor Jianjun Cheng, graduate student Hanze Ying and postdoctoral researcher Yanfeng Zhang published their work in the journal Nature Communications. "The key advantage of using this material is that it's catalyst-free and low-temperature, and can be healed multiple times," Cheng said. "These are very nice materials for internal cracks. This can heal the crack before it causes major problems by propagating." 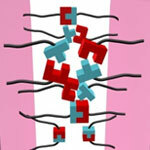 Other self-healing material systems have focused on solid, strong materials. However, the new study uses softer elastic materials made of polyurea, one of the most widely used classes of polymers in consumer goods such as paints, coatings, elastics and plastics. After the polymer is cut or torn, the researchers press the two pieces back together and let the sample sit for about a day to heal - no extra chemicals or catalysts required. The materials can heal at room temperature, but the process can be sped up by curing at slightly higher temperatures (37 degrees Celsius, or about body temperature). The polymer bonds back together on the molecular level nearly as strongly as before it was cut. In fact, tests found that some healed samples, stretched to their limits, tore in a new place rather than the healed spot, evidence that the samples had healed completely. See a video demonstrating the preparation and self-healing properties. The researchers use commercially available ingredients to create their polymer. By slightly tweaking the structure of the molecules that join up to make the polymer, they can make the bonds between the molecules longer so that they can more easily pull apart and stick back together - the key for healing. This molecular-level re-bonding is called dynamic chemistry. Dynamic chemistry has been explored in some other polymers, but those materials tend to be for specialized applications or laboratory settings, rather than the conventional polymers used commercially. By focusing on consumer materials and using readily available ingredients, the researchers hope that manufacturers could easily integrate dynamic materials. "We just buy commercial materials and mix them together, no fancy controls or special apparatus," said Cheng. "It's a very simple, low-cost, inexpensive process. Anybody can do this on any scale." Now that they've established the chemistry required, the researchers are exploring how dynamic polyurea could bolster different applications. For example, they could fine-tune the mixture so that a polyurethane coating or paint could be removable. "In some areas, when it's not necessary for the coating to be permanent and you want it to be removable, this chemistry may be applied to existing coating materials to make it reversible," Cheng said. "In general, polyurea and polyurethane are widely used. This chemistry could modify existing materials to make them more dynamic, healable." The National Science Foundation and the National Institutes of Health supported this research. Cheng also is affiliated with the departments of chemistry and of bioengineering, the Beckman Institute for Advanced Science and Technology, the Institute for Genomic Biology, the Frederick Seitz Materials Research Laboratory and the Micro and Nano Technology Laboratory at the U. of I. To contact Jianjun Cheng, call 217-244-3924; email jianjunc@illinois.edu. The paper, “Dynamic Urea Bond for the Design of Reversible and Self-healing Polymers,” is available online.